Rachel Nackman: Can you tell us a little bit about the process of making Drawing 230 (2008; fig. 1)? Teo González: First, I thought about I wanted to do and gathered the materials I would need. I made a grid of circles, using some of them as markers to divide the square of the piece into smaller squares. Then I repeated that process across the entire surface, until the piece looked like a chessboard, with rows of alternating circles and empty spaces. I filled those empty spaces with more circles, and then I filled all the circles with dots. I’ve used clay board for years now, and I’ve used pencils for as long as I can remember. I selected those materials to make this piece for their simplicity. I knew that this piece was going to be an oddity when I made it, because rather than composing an image by arranging thousands of drops and letting them dry out, as I usually did, I decided that I was going to draw them. It felt natural to choose something as basic as pencil and paper because I was starting something new. RN: Was this one of the first drawings that you made by drawing the circles? TG: It was only the second one that I made as an attempt to do a final piece. But I had also made some tests, just to see how it would work out. RN: Can you tell us a little bit about the way you made work before trying this new technique? TG: I would start by preparing the surface of the painting. Working with the support flat on a table, I would dissolve a little bit of acrylic enamel in water, and I would make a wash. Then I would apply drops of the wash to the surface with a paintbrush, and I would let each drop start to dry out. Before they were completely dry, I would put a smaller drop of undiluted acrylic enamel into the center of each drop, where a little bit of water remained. Then I would let the work dry completely. I wouldn’t stop until I filled the last spaces with these dots—then I was done. RN: Were you mindful of the time it was going to take to finish each work? TG: Well, there was no way to know how much time each work was going to take. I was always surprised by how much the end result would change depending on the weather. If the room in which I was working was very dry, the drops would dry faster—and vice versa. The funny thing is that once the drops started drying, all of them would dry at once. So the beginning of the process was slow, but as the drops started drying, there would come a moment when I lost control over what I was doing. I actually wouldn’t have time to think about what I was doing—I would be trying to tackle the piece at that point. RN: Like a physical challenge. TG: It was like a physical challenge, yes. That’s part of the process that I really haven’t missed since switching to drawing the drops. With the liquid medium, I felt like the outcome didn’t depend on me. I was just mediating—making sure that the thing got finished. I didn’t have all that much control. It was frustrating. RN: Was that dependence upon external factors—the environment and time—one of the reasons why you started thinking about drawing the dots? TG: Yes, definitely. Another important factor was that the original process limited the maximum size of the drops, which in turn meant that the size of the overall painting was also limited. If I draw the drops, I can draw them whatever size I want. I guess the decision was partially about environmental factors and partially about wanting to be able to play with scale. RN: In both senses, what you were really trying to do was maintain control. TG: Yes. I don’t think that there is too much intuition in my work. At the beginning there was, because I was exploring. In the final work, though, I want it to look good. Having completed the process as many times as I have, I’ve learned what can happen. RN: So you feel very comfortable with your process now? TG: I feel almost overconfident now. I started making the drops with paint in 1991. At the first exhibition I had of these works, someone asked me, “What are you going to do after this?” I said, “ . . . More of this?” Obviously. I kept on going, but I never knew where I was headed. I was amazed when years started passing and I still wasn’t at the end of this exploration. There was something that was keeping me going. The first time I drew the drops was in 2007, and this drawing is from 2008. So sixteen years after I’d started working with drops, I suddenly found myself at the beginning again. 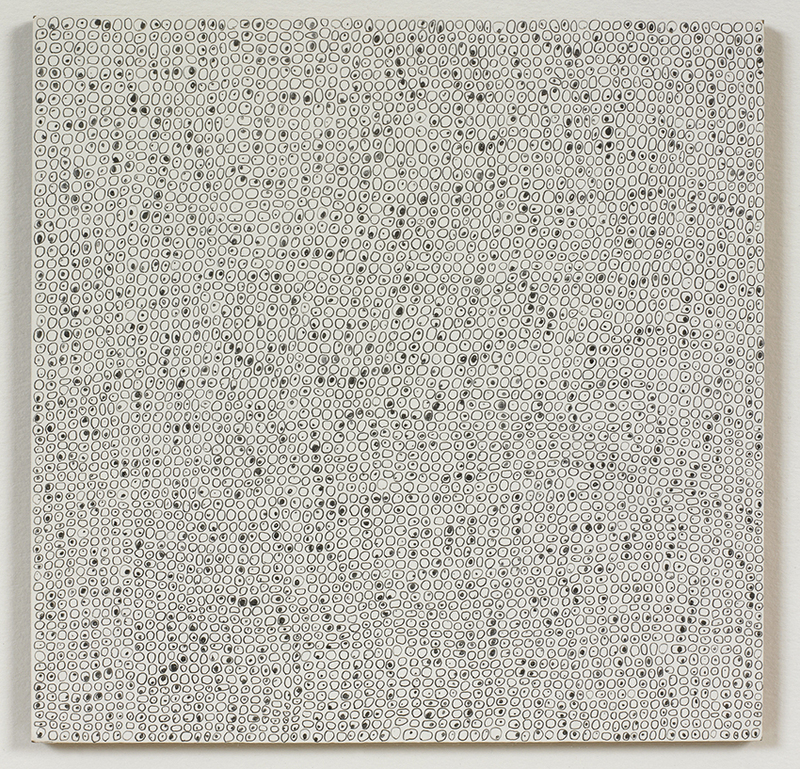 RN: Did you see the transition from making drops with enamel to drawing the dots by hand as the culmination of those sixteen years of working with paint? TG: It was definitely a transition. I’m not renouncing the painted drops; I see them as included in what I’m doing now. Except instead of allowing the process to be the protagonist, now I’m stepping on the stage to some extent. I still draw the drops in much the same way that I painted them. RN: To your hand it feels very similar. TG: Yes, it’s almost exactly the same thing. RN: How did you begin making the drops? TG: I started making this work as a reaction to what I was doing at the time. When I started painting, I tried to practice Abstract Expressionism. I loved it—I still do. But it was emotionally taxing work, and I kept falling into creative crises. I would lose track of what I was doing, whether or not I liked it anymore. I decided that if I wanted to keep on being an artist, I had to find a way to put some distance between the work and myself. Not literal distance but emotional distance. I thought that by using a ruler and a pencil to make straight lines I could make my work become a little more impersonal. A straight line will be straight no matter who pushes the pencil. Then I thought about how naturally occurring processes—like what happens when I drop one fluid inside another—also behave independently of the artist. They’re also very impersonal. The next step was putting it all together. That’s when I started doing the drops. I began by making freehand drawings of grids of dots—they were very loose. After that I tried drawing a pencil grid on the paper with a ruler. Then I became really purist and decided that if the grid was going to be there, I might as well make it with ink. I’m not trying to hide anything over here. At the beginning I was only working with ink on paper. Next, I discovered how to work with acrylic on canvas. For some reason, it felt very strange to put pencil or pen to a painted surface in order to draw the grid, so I designed a series of contraptions that would float a gridded net of fishing line an inch above the canvas. Then I would use a paintbrush to put the drops into each of the open spaces of the net. A few years after that, I finally felt confident enough to make pencil lines directly on the canvas. I actually liked doing this, but by then I had decided to start making the drops very small, and the little net no longer worked with a paintbrush. I decided I was going to draw a net directly on the surface of the canvas with a pencil instead. I drew it and liked it, so I kept on drawing the net. A little while after that, I started feeling that the grid for the drops was almost too tight. So I gradually widened the gauge of the net so that each opening in the grid could accommodate more and more drops. The entire process was about the question, “What if?” What if I do this? Sometimes it works, and sometimes it doesn’t. If it works, you’ve hit the jackpot. RN: So reaching this point was a graduated process of learning? RN: Did it become a question of challenging yourself? TG: Yes. What happens very often is that once you learn how to do something, your passion for making it lessens. So you try to change it little by little, because you want to enjoy the whole ride. I think it took me from 1991 to 2002 to go through the development I described with the drops. I could have done it faster if I’d known exactly where I wanted to go, but I never decided ahead of time what I was going to do next. I always thought my plate was full with thinking about how I was going to get out of this mess now. That process of discovery was and is very appealing to me. RN: What parameters do you set for a drawing before you begin making it? TG: The parameters I set change from series to series, but there are two constants that I always choose between for each piece: there will be lots of drops—or in this case drawn circles—or they will be tiny. I decide what color and what materials I will use, and I decide upon the size of the drops. It’s very basic planning because my pieces are very simple. There is some planning to do, but not that much. RN: Does that basic planning then free you to make decisions about other elements in the moment? TG: Yes. For example, I decide where to put the inner dots once the surface of my drawing is covered with little open circles. Some people might think that it’s an intuitive kind of decision making, but I wouldn’t say it’s very intuitive, because I’ve already done this several hundred times. I know what works and what doesn’t. RN: When you’re making decisions about where to place dots inside circles, what are you trying to achieve? TG: I’m trying to make an image that doesn’t attract your attention to any particular part of it. In that sense, I’m in a color field mode (so to speak), even if there is no color. I try to create an image that is more or less consistent. RN: In this particular drawing, your mark making extends to the edges of the sheet, but in some other works small images are centered on larger sheets. How do you make decisions about that? TG: I make two types of compositions: overall pieces and Seagram pieces. This is an overall piece, in which the drops extend to the edge of the sheet—the focus is on the image that I’ve made. I named the Seagram pieces after Mies van der Rohe’s building in New York City, because of the open square that he left in front of the tower. I think that square changes the way we see the building, and I thought it was a very bold move for Mies to leave so much of the space he’d been given undeveloped—and that on Park Avenue. I felt that leaving empty space around the drawn grid changes the piece into a quasi-object. That space makes the drawing behave in a completely different way from the overall pieces. Overall pieces are very direct, whereas the Seagram pieces provide several possibilities for how one can start looking at the piece. I try to give the viewer a choice. RN: What is it like for you to make a piece like this? How much time and focus does it require? TG: People always ask how long it takes. I used to answer that I make these drawings in my spare time, but I’m unemployed, so I have plenty of it. [Laughter.] I actually don’t know how long one drawing takes. I’ve never worried about how long it takes, because I don’t think that’s the idea that interests me. If I stopped to think about how long it’s going to take, many times I probably wouldn’t do it. I’m not a patient kind of person, but I’m very curious. For me, curiosity is the driving force. Once I have an idea, I must see it done; that’s what keeps me going. RN: You’ve said that you enjoy the process of making these drawings. TG: Well, yes. When you have an idea that you want to see completed, it’s enjoyable to see it coming out well, of course. RN: Do you ever consider something a failure? TG: Yes. It’s a failure when the end result strays from my original idea. And then I put it in the trashcan. There’s no point in keeping it. RN: You’ve said before that you choose to make work that speaks to the widest audience, without the burden of language or culture. What is it about the serial nature of your process that you think is universal? TG: Well, to me it’s more of a process of elimination. I might not defend the idea that the type of work I do is universal (although I sort of do think so), but I do think that other kinds of work are not universal—either the viewers know the language or they’re left out. In that sense, my work is very basic. I don’t intend to make something that everybody can understand, but rather to reach as many people as I can. To some extent the type of work that I do can end up speaking for and about itself. Teo Gonzalez (b. 1964, Spain) has work within the public collections of The Museum of Modern Art, New York; the Los Angeles County Museum of Art, Los Angeles; the National Art Gallery, Washington, DC; the Corcoran Gallery of Art, Washington, DC; the Hood Museum of Art, Dartmouth College, Hanover, New Hampshire; the San Diego Museum of Art, San Diego, California; Museo de Dibujo Julio Gavín, Sabiñánigo, Spain; the New Mexico Museum of Art, Santa Fe, New Mexico; and the Borusan Contemporary, Istanbul. His most recent solo exhibitions have been held at Spanierman Modern, New York (2008, 2010); Gallery Ihn, Seoul, South Korea (2008); Irvine Contemporary Art, Washington, DC (2008); Brian Gross Fine Art, San Francisco (2010); Galería Fernando Latorre, Madrid (2010); Eight Modern, Santa Fe, New Mexico (2010); Richard Levy Gallery, Albuquerque, New Mexico (2011); and Roy Boyd Gallery, Chicago (2011). His most recent group exhibitions have been held at the University of Richmond Museums, Richmond, Virginia (2008); the Los Angeles Municipal Gallery, Los Angeles (2008); Museo de Arte Contemporáneo Esteban Vicente, Segovia, Spain (2009); Spanierman Modern New York (2010, 2011, 2012); the Katonah Museum of Art, Katonah, New York (2011); and Borusan Contemporary, Istanbul (2011, 2012). Posted in Rachel Nackman, Teo González. RSS 2.0 feed.